Any two metals can be used to make a galvanic cell. Whether a metal will behave as an anode or a cathode in combination with another metal in the same soil environment, can usually be determined by its relative position on the galvanic series. The metal which appears higher up on the list (more negative) will, in general, be the anode and will thus corrode. The metal lower down on the list (more positive on the potential scale) will be the cathode and thus will not corrode. Of course, this galvanic action will not take place under open-circuit conditions; there must be a connecting circuit. Are these corrosion cells common? The answer is yes. 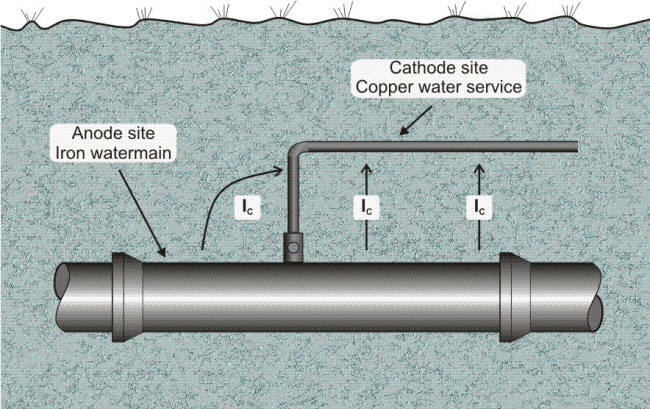 Whenever a copper pipe service line is directly connected to a cast iron gas or water main, a galvanic cell such as shown in the following Figure is formed. The soil is the electrolyte, the copper service line is the cathode, the iron (or steel) main is the anode, and the connecting circuit is completed by attaching the line to the main. Normally, such cells do not do any great amount of damage, because the anode (corroding metal) is so much larger than the cathode that the attack is spread out over a large area. 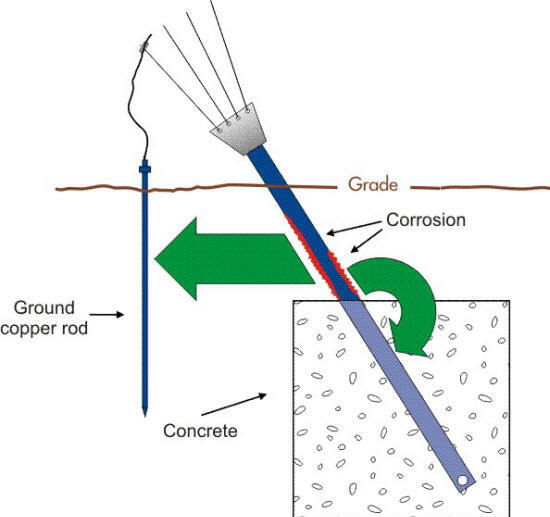 However, the situation can lead to the corrosion of steel when the surface area of the cathode (copper) approaches that of the anode (steel) such as shown in the following Figure. It can also be a problem when the surrounding soil is more conductive or corrosive in the region where the galvanic coupling exists as in the following Figure. 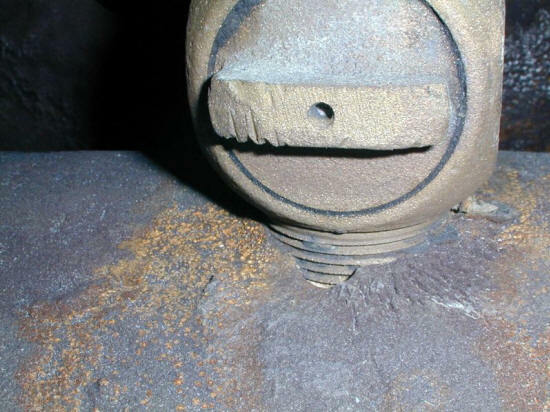 In this example the anodic corrosion of the anchor is partly due to the galvanic corrosion cell formed by the connection of ground copper rods. 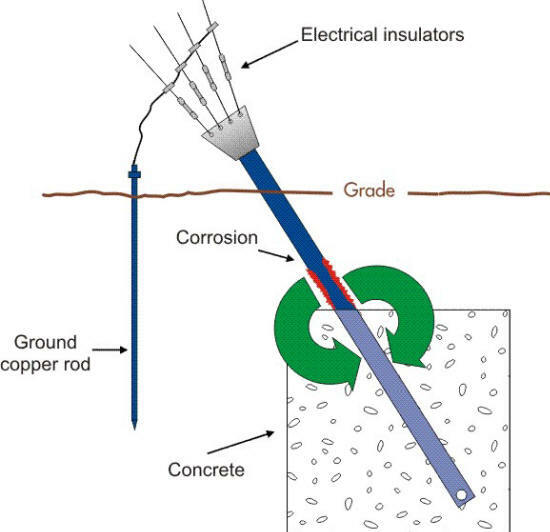 One way to minimize the dissimilar metal interaction that causes the corrosion of the structural steel anchor is to break the electrical path between these two components by adding insulators as shown below. However, this measure alone has proven to be only a partial solution to this type of problem since another corrosion cell is still active as will be described in the next section.